Best Seller! 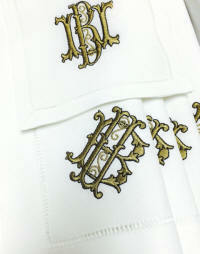 Two letter monogram with an optional accent outline stitch. 100% Linen available in White. Placemats & napkins gift-boxed with ribbon. Letters will be placed for best arrangement. Ships in 7-10 Business days. Allow additional time for larger orders.